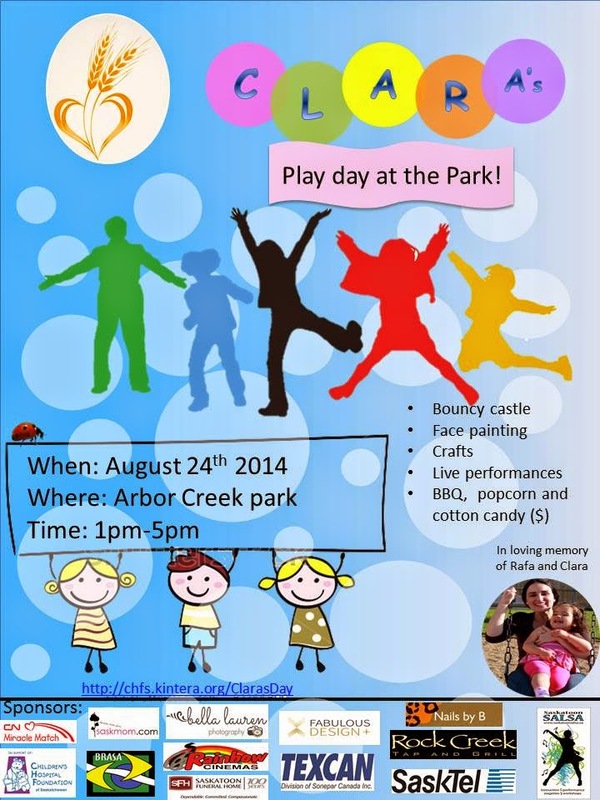 You and your kids are invited to a free and fun day in Arbor Creek Park on August 24, from 1 to 5 p.m. Families will enjoy a bouncy castle, face painting, live performances, balloon animals and a picnic. The story and purpose behind Clara's Play Day at the Park makes this afternoon even more special. Almost one year ago, a Saskatoon family was travelling to what was supposed to be a fun camping weekend with friends. Instead, they were involved in a tragic car accident. Rafaela (Rafa) Andrade, 26, died at the scene, and her husband Arthur and 2-year-old daughter Clara were taken to hospital. Arthur was treated for minor injuries. Their beautiful Clara suffered a broken neck and was declared brain dead at Royal University Hospital. Arthur extended the gift of life to other sick children by donating Clara's organs. Rafa's friend Fernanda Caminha said, "Last year, on August 24 I had the worst experience in my life when my best friend and her daughter had their lives taken in a car accident. Now one year has passed, and instead of remembering only the sadness involving this day, we want to celebrate the good moments, the laughs shared, the sweetest memories." Fernanda and other friends have planned Clara's Play Day at the Park, hoping to offer a memorable day for local families, while raising funds for the Children's Hospital Foundation of Saskatchewan and growing awareness about safe driving and blood and organ donation.